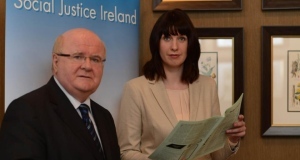 Dr Sean Healy and Michelle Murphy of Social Justice Ireland. Tax cuts will not solve Ireland’s infrastructure problems, nor will they improve social services and they won’t deliver a fairer society Social Justice Ireland has warned. This approach would lay the foundations for Ireland to deal with the many social, economic and demographic challenges it is currently facing and generate social and economic returns for the state, according to Dr Healy. Social Justice Ireland has again underlined the need for the Government to take a long-term approach by investing in the social infrastructure and services which will pave the way for a more sustainable and equitable future. “As a policy objective, Ireland should collect a level of taxation capable of adequately supporting the country’s economic, social and infrastructural requirements now and into the future” according to Michelle Murphy, Research and Policy Analyst, Social Justice Ireland. As a result of Ireland’s improving economic outlook, there are expectations that general taxes should be reduced, but Social Justice Ireland warns that the decisions we take today, will have a marked impact on the Ireland of the future. Key questions need to be addressed: What level of services should we expect? How much do we need to invest in Healthcare? Education? Public Transport? Correct decisions on these questions might not bear fruit immediately, but would make a huge difference to society in the future – and it is these decisions that we need to make today. Ireland currently faces key choices that will shape its future. If the correct choices are made Ireland could move towards becoming a country characterised by justice, fairness and the improving wellbeing of all its people. This requires Government to take a long-term view and make its decisions on this basis. The time to make the right decisions is now.